Parker Quartet violinist Daniel Chong advises music students. University of Iowa students who take classes in dance, music, and theater not only learn from accomplished faculty members but also from more than 200 guest artists each year. Photo by Tim Schoon. University of Iowa students who take classes in dance, music, and theater not only learn from accomplished faculty members, but also from more than 200 guest artists every year, broadening their academic experience and boosting job placement after graduation. Guests of the Division of Performing Arts visit campus for a day, a week, or even a semester at a time. While here, they teach master classes, create dances, lead rehearsals and workshops, and participate in Q&As. That diversity is exactly why faculty say it’s important to supplement their lessons with outside voices. Elizabeth Oakes, associate professor of instruction and director of the UI String Quartet Residency Program, agrees that interacting with professionals with varied experiences is important for students. Oakes says UI students are fortunate to be able to meet and work with so many talented artists, using the String Quartet Residency Program as an example. Parker Quartet violist Jessica Bodner works with University of Iowa students during a recent residency. 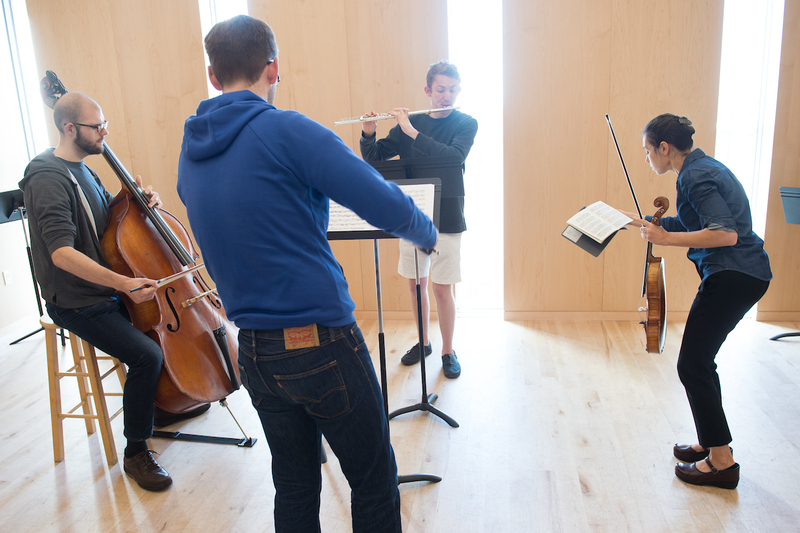 “It’s valuable for students to hear a different perspective than mine,” says Elizabeth Oakes, associate professor of instruction and director of the UI String Quartet Residency Program. “To me, that’s what the university is about: debating these things, thinking about them, and then finding their own way given lots of information. I’ve seen firsthand how much the students have learned by being exposed to a broad range to ideas. It’s powerful.” Photo by Tim Schoon. How the guests interact with students depends on the length of their stay as well as their particular expertise and interests. Guest artists commonly stay for several days to a week or two, often through a residency. While here, they may work on creative research, such as choreographing a work for Dance Gala, or take part in a production, such as directing a play. They participate in classes and meet with students one-on-one to further develop skills, whether it’s theater arts, instrumental, voice, or a particular type of dance. All three departments also make time for Q&As while guests are on campus. These informal sessions—known as Under the Hood in music and Cookies & Conversation in dance—provide a window into the artistic and non-artistic aspects of the guests’ professions. Lou Barker, a second-year student from Shubert, Nebraska, who is working toward a BA in violin performance, says the string quartets that visit campus are doing exactly what he hopes to do in the future. Oakes says it’s powerful for the student to see that the artists they look up to are real people and to understand that they have ups and downs and struggle artistically at times. Oakes tells a story about a Q&A with a string quartet made up of women who all had young children. She says her students later commented that it was helpful to hear them talk about that and get a sense of what a career with children can look like. At times, guests are only on campus for a day or even a few hours, but that doesn’t mean students won’t get time with them. Semester-long stays are less common, but they do occur. For example, the UI this fall is hosting alumni Robin Green and Mitchell Burgess, the Emmy Award–winning duo behind Northern Exposure, The Sopranos, and Blue Bloods. The couple is teaching a Writing for Television course for undergrads and graduate students and providing a professional-level mentorship to two recent graduates through a privately funded postgraduate fellowship. The benefits of having guests on campus are numerous, with the most obvious being they help students sharpen their skills. MacVey points to guests who work intensively with graduate students in the playwriting and directing programs as a good example. Miller has worked intensively with a few guests while pursuing her MFA at the UI, including Monica Bill Barnes and Shannon Alvis for both the 2017 and 2018 Dance Gala productions. She says she appreciates the real-world experience these opportunities provide. These learning experiences also double as networking. Along with playwrights, directors, and designers working on productions throughout the year, the Department of Theatre Arts also hosts writers, producers, casting agents, and directors to meet with students and provide feedback during the annual Iowa New Play Festival. “One certainly hopes they see a student and wants to hire them later,” MacVey says. Kowal, MacVey, and Oakes all agree these connections are particularly beneficial because of geography. “We’re not in New York City or Chicago where you can just walk down the street and meet these people or regularly see them perform,” MacVey says. “The music world is very small, but we’re building that sense of community even though we’re off the beaten path geographically,” Oakes says. Students aren’t the only ones to benefit from visiting artists. Faculty say they also are inspired by seeing and becoming involved with off-campus colleagues’ creative processes.